Calling ALL of my apple obsessed BFFF readers! Can I count myself too?! We just wrapped up a weekend trip to Apple Hill in a little city called Placerville. It is one of my favorite places in the whole wide world. We had all things apple, from fudge to pie! Oh yeah, and Charlie caught a trout. It was the cutest thing ever! If you’re not following me on my Instagram stories, then you’re missing all the fun! I am still on an apple kick after such a fun weekend, so this post could not come in at a better time. ;) I cannot wait to personally recreate this look next fall. So often we get stuck in the entertaining rut of table, charger, dinner plate and napkin…but the fun thing about entertaining is that it has no rules! While there is a time and place for a proper formal table, there is also a time and a place to be creative and mix things up. Don’t get me wrong, I am a lover of all things fancy, but sometimes simple actually is better. This pallet party is a perfect example of just that, and not to mention, it’s a fall lover’s dream! 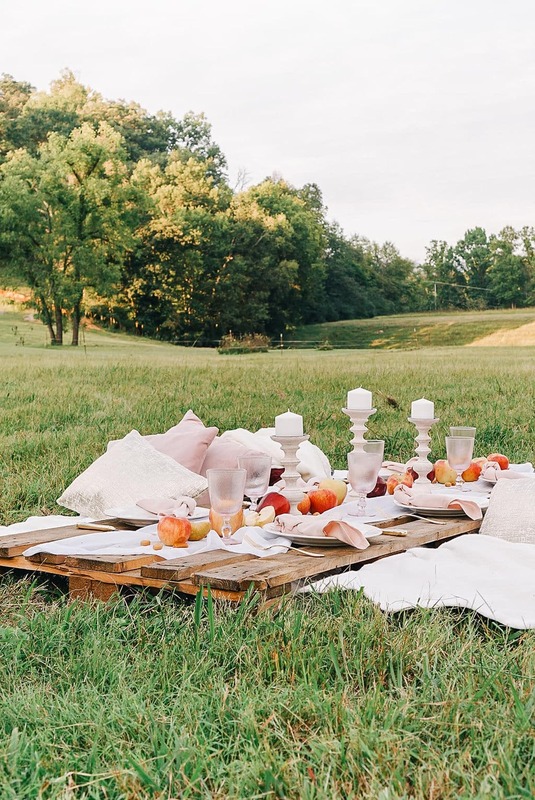 If you are one of the lucky ones that lives in an area where you can host Friendsgiving outdoors, this would be an amazing theme. 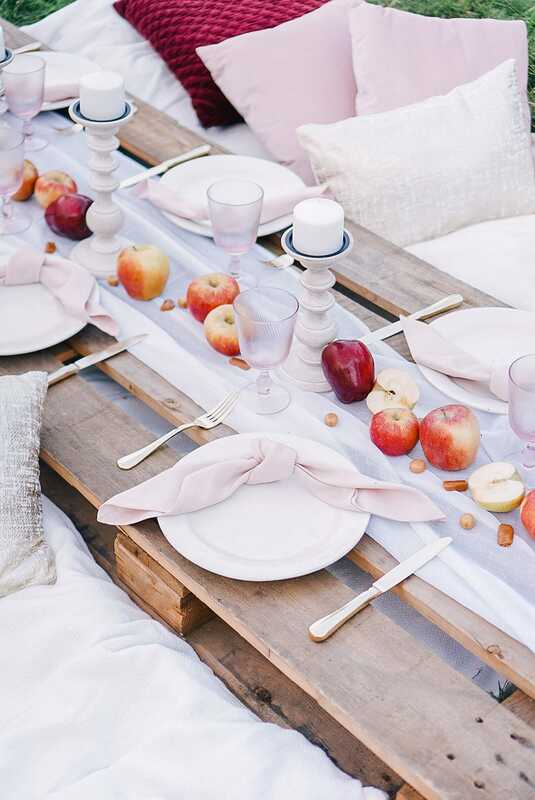 Here are a few tips to creating your own pallet party! First things first, what are your guests going to sit on? For this party, I chose to lay down an extra large cotton blanket. I loved how soft and cozy it felt and wanted guests to feel completely comfortable while lounging about. To provide even more comfort, I added throw pillows in coordinating colors and various sizes. These pillows not only added an extra layer to sit on, but also brought beautiful elements of color and texture to the decor! P.S. Velvet pillows all the way! When choosing your pallets, it is important to consider how many guests you need to accommodate. I used two 48 x 40 pallets for six people. This was the perfect length for table spacing and comfort! One point to note is that not all pallets are the same. Due to the more rustic nature of them, they tend to vary in size and structure. When looking for a pallet, I suggest setting two side by side before purchasing them to make sure they will make an even eating space. If you want a higher table, you can always stack pallets on top of each other for height. In the relaxed theme of the party, I chose to keep both the centerpiece and place settings simple. I love using seasonal elements in my tables, especially fruits! 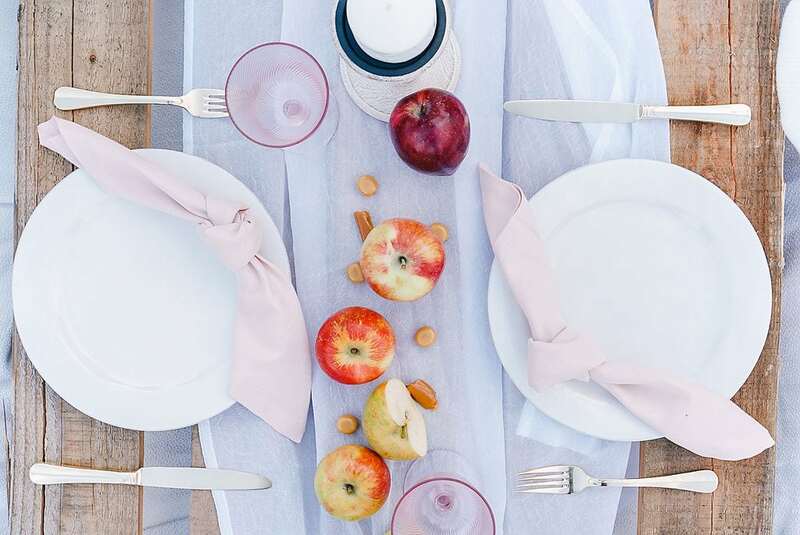 Since apples are a staple during the fall season, what better way to decorate the table than with a gorgeous line of apples?! I chose to use Red Delicious and Braeburn apples, as I loved the color in these varieties. To add a little more depth to the table, I scattered caramels throughout. They also make for the perfect sweet treat between courses! My favorite part about this party is that it is so versatile. 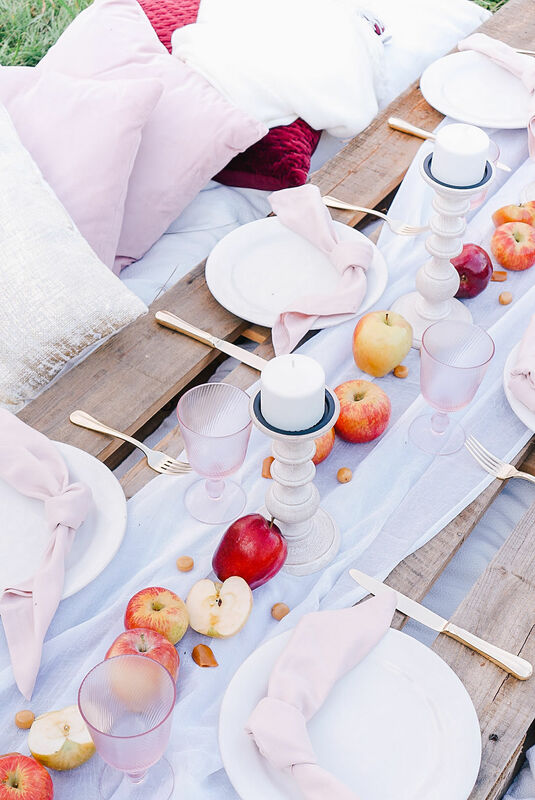 Once you have the pallets, you can create a cozy party with what you have on hand in no time at all! What would you add to your pallet party? !